Ansty Park is the new home for technology and innovation in the heart of the UK’s key transport hub with six motorway junctions within a 20 mile radius and direct access to junction 2 of the M6 approximately 4 miles north of Coventry. Significant development has already been undertaken with occupiers including MTC, HTRC, Sainsbury’s, FANUC, AVL and The London Taxi Company. IPG are currently on site. Ansty Park will provide 1.5 million sq ft of space set in 100 acres of beautiful landscaped parkland and has been designed to ensure that the creation and sharing of knowledge is at the heart of the park’s future development. 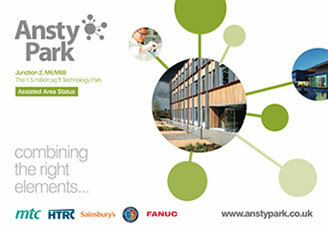 Ansty Park is a sustainable development which balances environmental impacts with social and economic benefits. The masterplan reflects a landscape-driven approach. Existing landscape forms are used and enhanced, creating green buffers which will act as wildlife corridors and recreational routes. Delivering bespoke Freehold and Leasehold opportunities for occupiers seeking new design and build premises for industrial, technology or research and development uses.